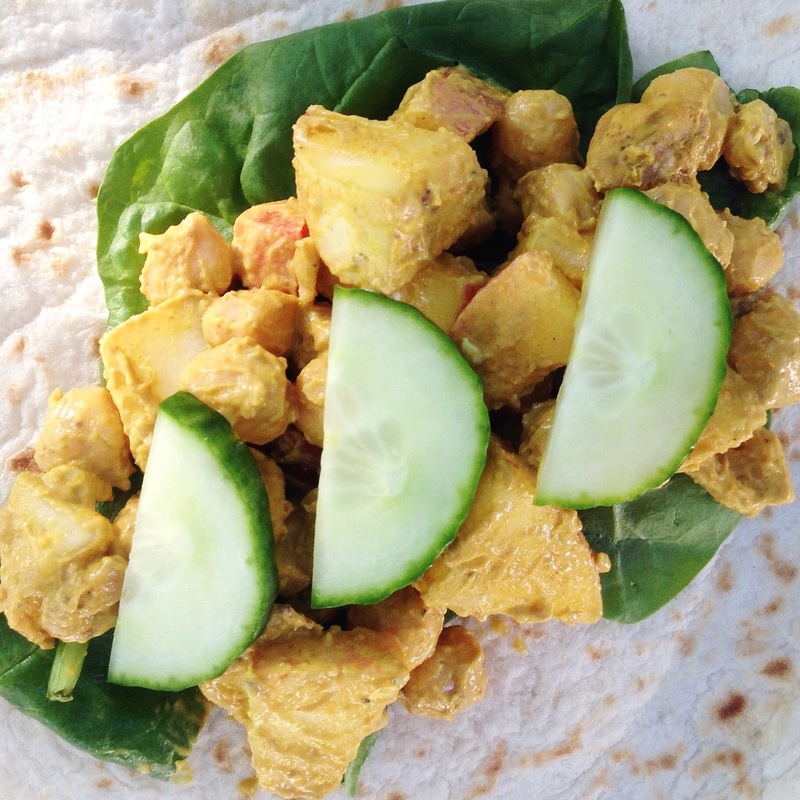 This is sort of my version of the classic curried chicken salad. I used to love those when I ate meat – if there was a curried chicken salad sandwich at a deli I would get it every time. So good. But what’s better than chicken? CHICKPEAS! My favorite food! I could just pour those little golden legumes right from the can into my mouth. I do sometimes. No shame. Having said that, if you do eat meat, you could totally add or sub in grilled chicken and this would still be really good! This recipe uses thinned-down hummus instead of mayo or vegan mayo. I always HATED mayo so the dairy-free substitute doesn’t really appeal to me either. Plus, it’s more expensive and less useable on other things than hummus. I saw a salad recipe that used thinned out hummus once a couple years back, can’t remember where, but I’ve used that in place of mayo ever since when making something like this! Rinse the chickpeas and place in medium-sized mixing bowl. Chop up the apple and dice the red pepper and add those to the bowl. Throw in a handful of walnuts. Put 1/2 cup hummus in a small bowl and thin it down – add little bits of water until it’s a creamy, mayo-like consistency. 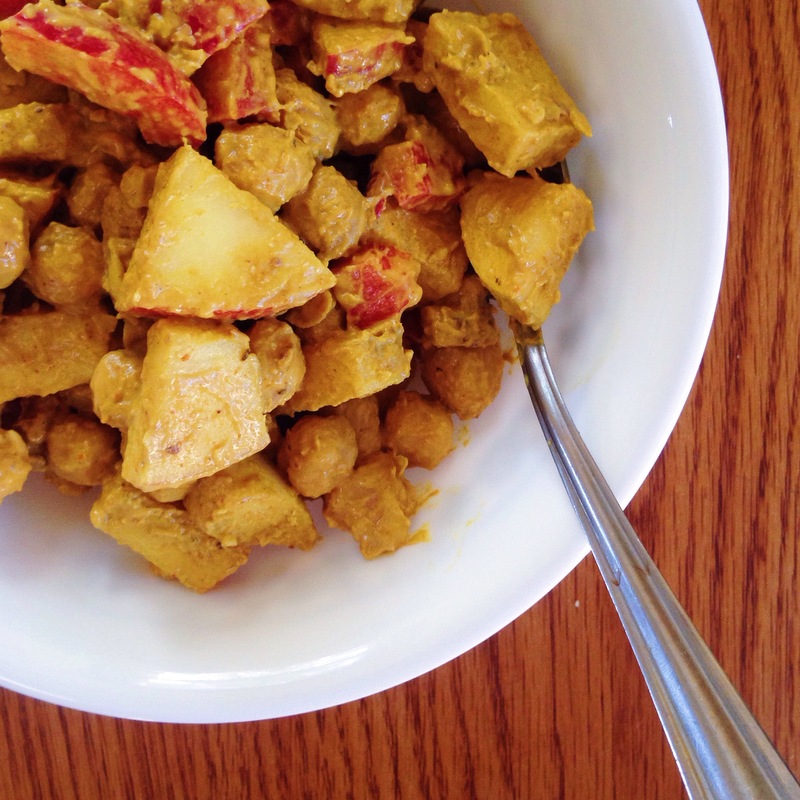 Add into the chickpea/apple mix along with the curry powder and a bit of black pepper. Mix it well. 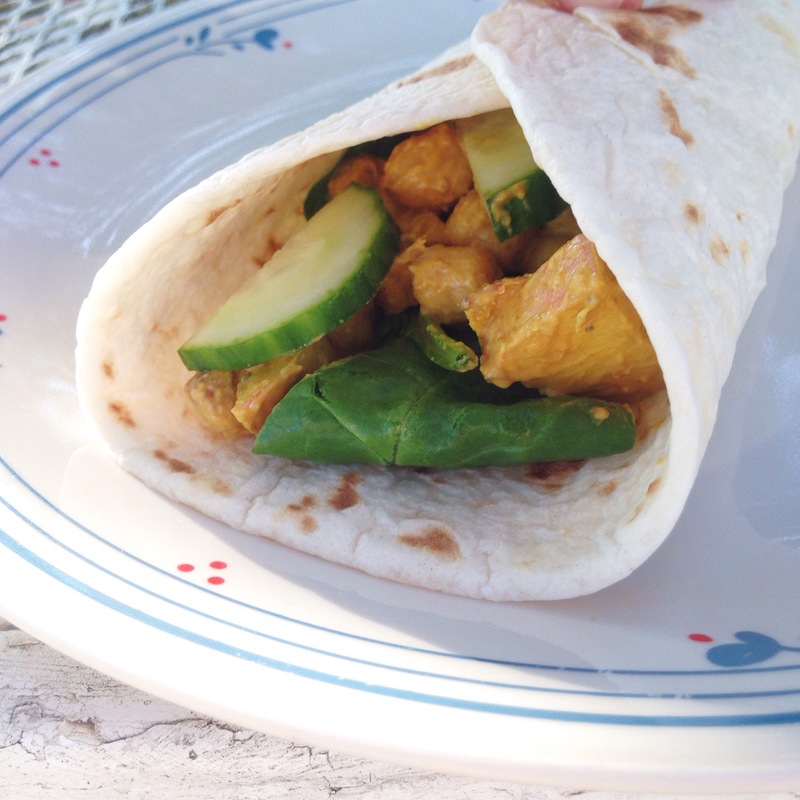 Taste and adjust – this sort of depends on the curry powder you use – if it’s too strong curry flavor add more hummus and/or a drizzle of agave – if it’s bland add more curry powder or some fresh basil maybe, or salt and pepper to taste. Makes enough to last for a few days of lunches. This is one that is good to make ahead – it’s better the next day! Switch it up and eat in a wrap or over greens in a salad. You could also use (cooked) potatoes instead of chickpeas, or grapes instead of apples, or cashews instead of walnuts! Oh Yum! I will definitely have to try this one!